If the planetary science community gets its way, more money will be earmarked for technology development, and NASA will get its first and maybe second flagship mission since 1990. Additionally, missions that have already been approved or are ongoing, such as Messenger and Kepler, will continue during the next 10 years. These are the recommendations set forth in the Planetary Sciences Decadal Survey report, which was unveiled to about 1,300 scientists attending the Lunar and Planetary Sciences Conference in The Woodlands, Texas in March, 2011. 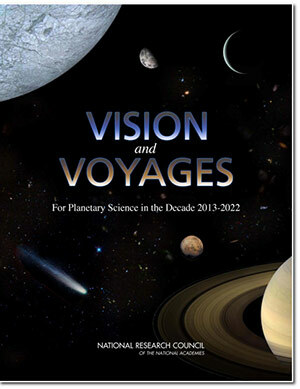 Prepared by the National Research Council of the National Academies of Science at the request of NASA and the National Science Foundation (NSF), the report looked at the current trajectory of our planetary science and exploration programs and made recommendations for future efforts between 2013 and 2022. The complete Planetary Sciences Decadal Survey report is available free online – just click on the image of the report cover at left. Dr. Steve Squyres of Cornell University chaired the Steering Committee conducting the survey. The Committee oversaw five judging panels of leading scientists that gathered input from their respective communities. The five panels were: the Inner Planets, Outer Planets, Primitive Bodies, Mars, and Outer Planet Satellites. Astrobiology was integrated across all five panels. Beginning in the summer of 2009, 1,669 authors and endorsers drafted white papers that recommended topics for study. All 1,669 were invited to present at panel meetings held in conjunction with conferences and shared via webcast. The panels produced a draft report which was peer-reviewed by 18 scientists. Twenty-five candidate missions emerged from this process. These were then analyzed by the Applied Physics Laboratory, Goddard Space Flight Center, and the Jet Propulsion Laboratory to determine the technical requirements and develop initial cost estimates. Each panel then assigned priorities within their panel’s jurisdiction “Mercury versus Venus—the Inner Planets Panel made that determination,” Squyres explained. The top candidates were then subjected to a Cost and Technical Evaluation (CATE), performed by the Aerospace Corporation. “They used actual costs of analogous missions to avoid the inherent optimism of advocates,” Squyres said. The CATE values were about 60 percent higher than the initial estimates. The studies cost NASA and NSF the bulk of the $8-10 million spent on the survey over a two-year period. But Squyres stressed that these studies were crucial to producing realistic budget numbers upon which to base decisions. The Steering Committee made its recommendations based on the best science return for the money, but also considered a balance across targets, mission size, technical readiness, and availability of trajectories. “All recommendations were achieved with a strong consensus,” Squyres said. The biggest challenge was meeting the projected budget that NASA provided, which assumed a total of $1.5 billion in 2011, rising to about $1.9 billion by 2022. The committee first totaled up funds for research overhead and already-approved programs that will mostly be completed by the middle of the next decade. The uncommitted money remaining under the NASA projected budget cap is referred to as the Planetary Science Decadal Planning (PSD) Wedge. Graph: The Decadel Survey’s recommended program funding allocations for 2013-2022 are shown in FY 2015 dollars. Note the president’s plans to cut five-year planetary science budgets to $1.2 billion in FY 2016. 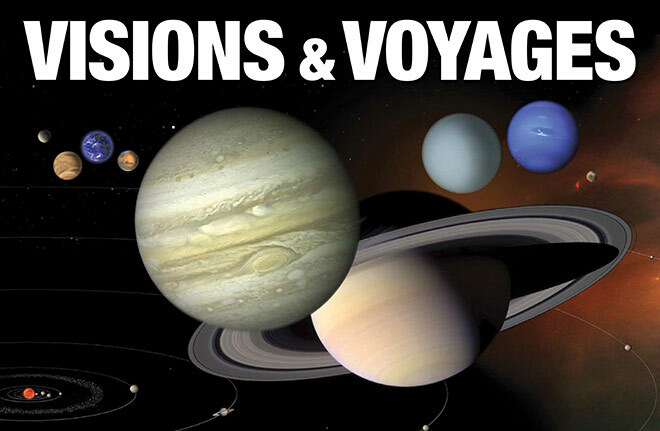 If this five-year budget is enacted, there will be no planetary science flagship missions. The report recommended filling the PSD Wedge with more Discovery program missions, such as the four currently approved. The committee is satisfied with the way Discovery missions are selected, and declined to interfere in that process. Squyres said, “We’ll rely on the creativity of our community” to make the mission choices. The report also recommended filling the wedge with two more New Frontiers (NF) missions such as NF-1, New Horizons (scheduled to reach Pluto in 2014); and Juno (scheduled to launch in August and reach Jupiter in 2016). The report endorsed all three candidates for NF-3, including a sample return from the Moon’s south pole, a Venus atmospheric probe/lander, and a sample return from an asteroid that has a chance to collide with Earth in 2182. The committee suggested that any not selected as NF-3 should be reconsidered for NF-4, with the addition of two more potential programs, a probe of Saturn and a tour of Trojan asteroids. For NF-5, they added an Io observer and establishment of a lunar geophysical network to the menu from which NASA will make its choice. If MAX-C costs more, “we’ll cancel it and go to the next on the list,” Squyres said. The next flagship mission is the Jupiter Europa Ocean (JEO). “It’s an important mission,” Squyres said, “but as currently conceived, it is unaffordably expensive. “ The CATE estimate for JEO was a whopping $4.7 billion. Next in line is a Uranus orbiter and probe, estimated to cost around $2.7 billion. This mission would begin as MAX-C ramped down. Squyres noted that if this mission is pushed beyond 2022, Neptune may be a better choice because of trajectory considerations. The fourth flagship is either a Venus climate mission at $2.4 billion, or an orbiter around Saturn’s moon Enceladeus at $1.9 billion. 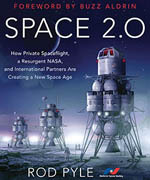 Noting that the original Grand Tour of the Solar System was “descoped” to be less expensive and became the Voyager program, Squyres said, “Descoping, when it is done right, can lead to great missions.” Squyres emphasized the need to coordinate descoping and share costs with international partners. 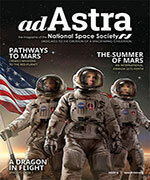 Green, who is responsible for implementing the report’s recommendations, said, “My contention is that we need to partner now more than ever before to be able to make those [flagship] missions a reality.” The European Space Agency is already involved in planning for the proposed Mars and Jupiter missions. Marianne Dyson is an author and former NASA flight controller who serves as an NSS advisor, chairman of the NSS Publications Committee, and a member of the NSS Policy Committee. Visit her online at www.mdyson.com.